Within this context of improvement, it is useful to consider how current design practices align with resilience objectives. The International Building Code (IBC) includes countless provisions and guidelines for designing structures to better withstand disasters. It is updated on a three-year cycle and, throughout its history, has continued to evolve to improve building performance. Although building codes accept that some non-structural and structural damage will occur in a major event, they seek to preserve life safety, prevent structural collapse, and ensure the superior performance of critical and essential facilities, such as hospitals and fire stations, relative to other structures. For wood building design, the code is supported by referenced standards such as the National Design Specification (NDS) for Wood Construction, Special Design Provisions for Wind and Seismic (SDPWS), and Wood Frame Construction Manual (WFCM). 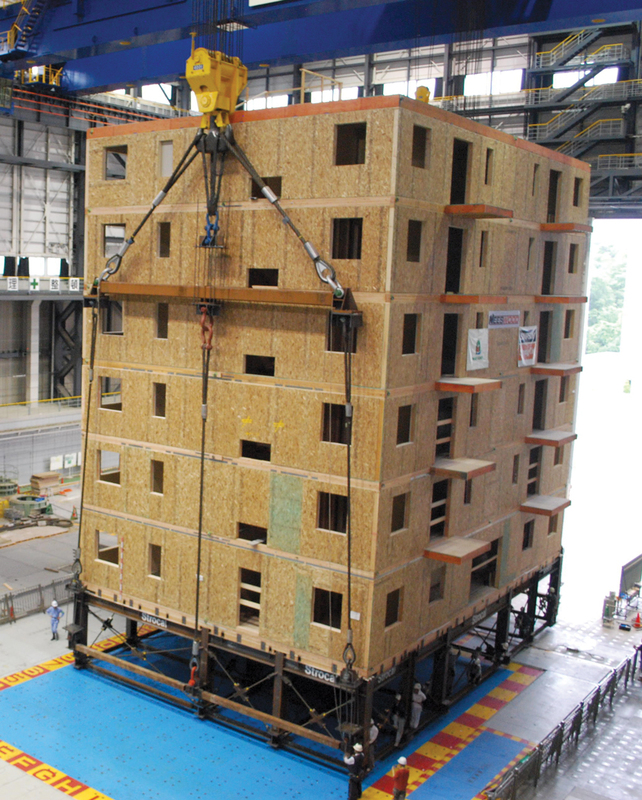 These standards provide tools for the design of wood buildings to meet structural loadings associated with naturally occurring threats, such as wind and seismic events. From a resilience perspective, an important aspect of the IBC is that it is scaled to reflect risk—which, in this context, describes the combination of event probability and consequence of building failure. Buildings are classified into risk categories based on use, from Risk Category I for those representing a low hazard to human life in the event of failure (such as storage buildings) to Risk Category IV for structures with greater consequences associated with their failure (such as hospitals). The higher the category, the greater the evaluated risk. They are further defined based on the likelihood of a specific type of event occurring. Buildings constructed in regions known for hazards such as hurricanes, earthquakes, or floods, for example, are subject to design requirements that make them better able to withstand these events. For wind and seismic design, statistical modeling based on prior event history is used to anticipate the magnitude of future events, even if they have not yet occurred at that scale. Seismic design forces are specified in the IBC to allow for proportioning of strength and stiffness of the seismic force-resisting system. Structures with ductile detailing and redundancy, and without structural irregularities, are favored for seismic force resistance. These beneficial characteristics are specifically recognized in seismic design requirements. The IBC establishes the minimum lateral seismic design forces for which buildings must be designed primarily by reference to ASCE 7-10: Minimum Design Loads for Buildings and Other Structures.3 For wood buildings, design guidance is provided in the NDS, SDPWS, and WFCM. Light weight. Wood-frame buildings tend to be lightweight, reducing seismic forces, which are proportional to weight. Ductile connections. Multiple nailed connections in framing members, used in shear walls and diaphragms of wood-frame construction, exhibit ductile behavior (the ability to yield and displace without sudden brittle failure). Redundant load paths. Wood-frame buildings tend to be comprised of repetitive framing attached with numerous fasteners and connectors, which provide multiple and often redundant load paths for resistance to seismic forces. Further, when wood structural panels such as plywood or oriented strand board (OSB) are properly attached to wood floor, roof, and wall framing, they form diaphragms and shear walls that are exceptional at resisting these forces. Compliance with applicable codes and standards. Codes and standards governing the design and construction of wood-frame buildings have evolved based on experience from prior earthquakes and related research. Codes also prescribe minimum fastening requirements for the interconnection of repetitive wood-framing members; this is unique to wood-frame construction and beneficial to a building’s seismic performance. Subjected to three earthquakes on the world’s largest shake table in Miki, Japan, this full-scale wood-frame apartment building performed excellently with little damage. Research is also key to the development of new building materials and systems that could help communities meet more stringent resilience criteria, such as the mass timber products being used in taller wood buildings. The impetus for timber high-rises, which already exist in other countries, is largely based on wood’s renewability, low embodied energy, and lighter carbon footprint compared to other materials. The fact that wood buildings continue to store carbon while regenerating forests absorb and sequester more carbon is viewed by many as a compelling reason to expand the use of wood. 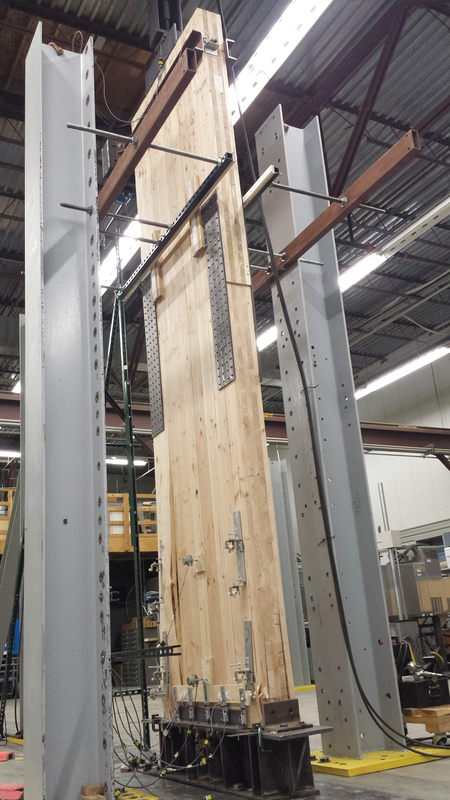 Another test evaluated “rocking” mass timber shear walls for use in high seismic regions.7 Seismic activity was simulated by cyclic loading that pushed and pulled the top of a 16-by-4-foot CLT panel with an embedded vertical pretensioned rod into a rocking motion. The wall was able to reach 18 inches of displacement while maintaining its ability to self-center back to a vertical position. The result: the series of tests demonstrated the ability of this innovative building system to resist earthquake forces. In this rocking test of a CLT shear wall, the panel maintained its lateral load-bearing strength under cycling loading to simulate seismic conditions and returned to a vertical position at completion of the test. Structural wind-loading requirements are specified in Chapter 16 of the IBC and obtained primarily through reference to ASCE 7-10. The minimum requirements are intended to ensure that every building and structure has sufficient strength to resist these loads without any of its structural elements being stressed beyond material strengths prescribed by the code. The code emphasizes that the loads prescribed in Chapter 16 are minimum loads and, in the vast majority of conditions, the use of these loads in the design process will result in a safe building. However, it also recognizes that a designer may, and sometimes must, use higher loads than those prescribed. The commentary to ASCE 7-10 outlines conditions that may result in higher loads. One of wood’s characteristics is that it can carry substantially greater maximum loads for short durations than for longer periods of time, as is the case during high wind and seismic events.8 As with seismic performance, the fact that wood buildings often have repetitive framing attached with numerous fasteners and connectors also helps to resist forces associated with high winds, as do diaphragms and shear walls made from wood structural panels properly attached to wood wall and roof framing. Because of the low probability that a building will incur a direct hit from a tornado, the extreme winds of tornadoes are not included in building code requirements for the wind design of buildings other than tornado shelters. However, it is generally agreed that a building properly designed and constructed for higher wind speeds has a good chance of withstanding winds of weaker tornadoes. Statistically, weaker tornadoes—rated by the National Weather Service as between EF-O and EF-2 on the Fujita Tornado Damage Scale—comprise 95 percent of all tornadoes. Stronger tornadoes (rated EF-3 to EF-5) require more rigorous design but are much less common. Designing for higher wind speeds can make a significant difference in terms of withstanding loads from even these tornadoes when the structure is located along the outer reaches of the area influenced by the vortex of such storms. After a devastating tornado season that cost hundreds of lives and thousands of homes in 2011, the FEMA Mitigation Assessment Team investigation found that newer homes generally performed well under design-level wind loading, but a lack of above-code design left buildings vulnerable to damage.10 Appendix G of the report, which makes reference to the WFCM and includes similar approaches, lays out prescriptive techniques that can improve building performance during weaker tornadoes. It notes that “Strengthening buildings by maintaining load path continuity and reinforcing connections has proven successful for mitigating hurricane and wind damage, and provides a good model for mitigating tornado wind damage.” Techniques are also provided for developing a complete load path starting from an engineered design for wind resistance—i.e., sheathing to roof framing, roof framing to wall framing, and wall framing to foundation connections. Highlighting wood’s recognized performance as a structural material, FEMA P-320: Taking Shelter from the Storm: Building a Safe Room for Your Home or Small Business, includes information and design drawings for building wood-frame safe rooms. As with seismic performance, post-disaster investigations are essential to improving the performance of buildings during high-wind events, leading to recommendations from bodies such as FEMA and the improvement of building codes. Testing of building materials, systems, and techniques is another key part of the equation. For example, the ‘Wall of Wind’ (WOW) at Florida International University is capable of simulating a Category 5 hurricane and has contributed greatly to the understanding of hurricane impacts and their mitigation. A collaboration with the International Hurricane Research Center, it is viewed by the insurance industry as revolutionary to wind engineering in the same way crash testing was to the automotive industry. Similarly, the Insurance Institute for Business & Home Safety research facility includes a wind tunnel able to test full-scale one- and two-story buildings under realistic disaster scenarios in a controlled, repeatable fashion. Building codes require all buildings to perform to the same level of safety, regardless of materials, and wood buildings can be designed to meet rigorous standards for performance in a fire situation. Effective fire protection involves a combination of active and passive features. Active fire safety features include fire detection or suppression systems that provide occupant notification, alarm transmittance, and the ability to suppress fire growth (sprinklers) until the fire service arrives. In the context of resilience, where the focus is often fires that burn in the aftermath of an earthquake or other disaster, passive fire protection is especially important. Passive fire protection is what contains a fire in the area of origin or slows the spread of fire through the use of fire-resistant building elements, such as fire-resistant floors and walls, and open space. In general, there are two passive measures that decrease a building’s fire hazard: isolating the building from other structures and constructing the building with fire-resistive materials. IBC Chapter 5 defines the allowable height and size of wood buildings based on the type of construction, occupancy, presence of a fire sprinkler system, degree of open perimeter, and resistance of the assemblies. 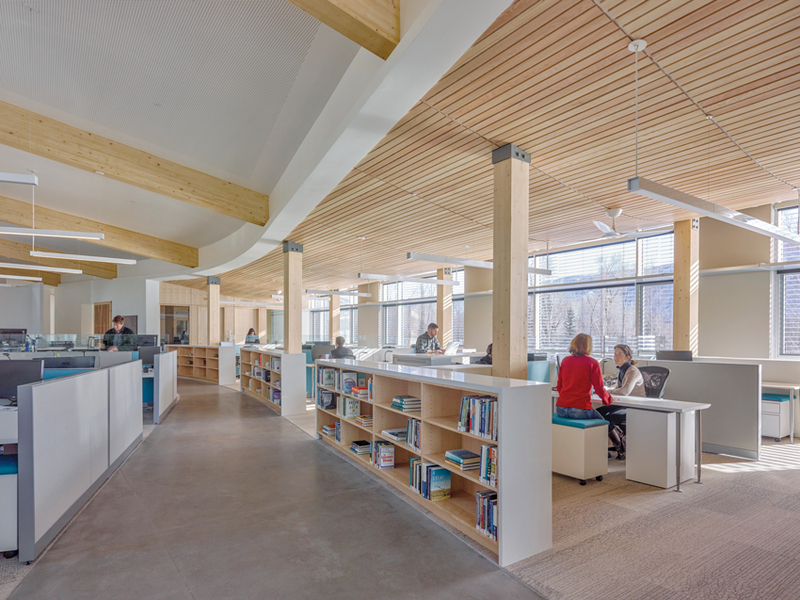 Designed with a combination of mass timber, structural insulated panels, and dimension lumber, RMI’s new Innovation Center meets a number of resilience objectives. The project is net zero energy, designed and tested to meet Passive House protocols. Its energy model was run against the new Leadership in Energy and Environmental Design (LEED) pilot credit for Passive Survivability and Functionality During Emergencies for Option 1 (Thermal Resilience), requiring it to maintain livable temperatures during a power outage that lasts seven days during peak summer and winter conditions of a typical year. Thanks to a highly insulated envelope, the project met this criteria for the entire year, including peak periods, without any power. Daylighting strategies also allow the building to operate without electrical lighting for 91 percent of the annual daytime office hours. The use of CLT structure on the first floor also allowed for dedicated service chases and increased floor-to-floor dimension, with extra space for future systems modification, addition, or expansion. This ‘future proofing’ will allow the building to be at the forefront of technology well into its 100-year design target. Other features include a lightning protection system to protect the building systems and infrastructure, and siting above the 500-year flood plain event (instead of the more common 100-year event level). With growing interest in tall wood buildings, the fire performance of mass timber is often identified as a research need. However, a great deal of information is known. The structural fire resistance of mass timber elements has long been standardized in the NDS, which includes a char calculation procedure to provide calculated fire resistance. The NDS was also expanded in 2015 to address the design of CLT buildings for structural and fire performance. Similarly, the IBC was revised in 2015 to expand the use of CLT into the heavy timber construction classification (Type IV). Changes to the IBC were based in part on a successful fire-resistance test on a load-bearing CLT wall. The test, conducted by AWC in accordance with ASTM E-119-11a: Standard Test Methods for Fire Tests of Building Construction and Materials, evaluated CLT’s fire-resistance properties. The five-ply CLT wall (approximately 67⁄8 inches thick) was covered on each side with a single layer of 5⁄8-inch Type X gypsum wallboard and then loaded to 87,000 pounds, the maximum load attainable by the testing service equipment. The 10-by-10-foot test specimen lasted 3 hours, 5 minutes, and 57 seconds (03:05:57)—well beyond the 2-hour goal. Further study and full-scale tests continue to support expansion of mass timber’s applicability. Other areas of research include new assembly configurations, performance under nonstandard fires, and the development of prediction tools. For more information, the latest research can be found at www.ThinkWood.com/research. Whatever the building material, there are two important aspects of flood-resistant design: elevating the building above the design flood elevation, and designing for the increased loads associated with a building that’s higher off the ground. Reinforcing the performance of wood in appropriate applications, FEMA P-550: Recommended Residential Construction for Coastal Areas, includes a number of open foundation timber pile solutions for elevating structures to withstand floods. FEMA TB2: Flood Damage-Resistant Materials Requirements highlights wood products “capable of withstanding direct and prolonged contact with floodwaters without sustaining significant damage,” with “prolonged contact” defined as at least 72 hours, and “significant damage” meaning any damage requiring more than cosmetic repair. For timber pile foundations, preservative treated wood is required.